The 1832 Reform Act is the most obvious and important political context for Middlemarch: the action of the novel takes place between September 1829 and May 1832, so during the period leading up to the passing of this Act in June 1832. Much of the novel’s political context is presented indirectly. The most direct way Middlemarch involves us in politics is through Mr. Brooke, who runs for Parliament himself. His speech in Chapter 51 is among the novel’s most comical scenes — that in itself may hint at how much faith George Eliot put in democracy as the likely means to the kinds of reforms she’s most interested in, or it may reflect more on Mr. Brooke, whom we first meet as a man of “acquiescent temper, miscellaneous opinions, and uncertain vote.” At the end of the novel, after all, Will Ladislaw becomes an “ardent public man” and an MP. 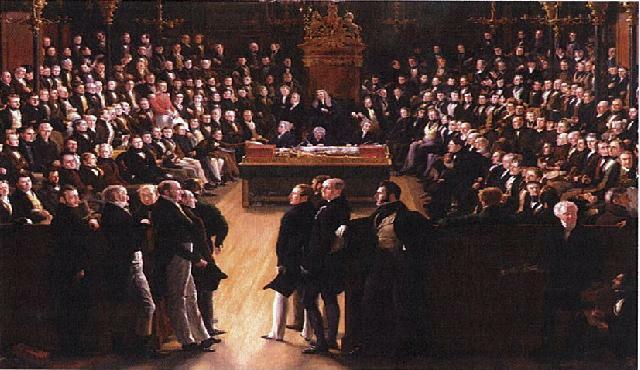 Middlemarch was written not long after the passing of the 1867 Reform Act, so issues of political reform were still very immediate for the novel’s first readers. In 1867, at the invitation of her publisher, John Blackwood, George Eliot wrote an “Address to Working Men” in response to the Act’s passing; it was written in the voice of her character Felix Holt, who in his own novel Felix Holt, the Radical (published in 1866), dedicates himself to the truly radical work of reforming people’s minds, rather than campaigning for their votes. Does the “Address” represent George Eliot’s own political views? It certainly seems “consistent with Marian Evans’s thinking about politics in the years following the Reform Bill on 1832,” as Nancy Henry says, but it’s interesting that she did not choose to make the statement in her own voice: clearly she preferred to keep some kind of distance between her authorial or biographical persona and this kind of overt political proclamation. Jerome Beaty’s lucid essay “History by Indirection: The Era of Reform in Middlemarch” (published in the journal Victorian Studies in 1975 and reprinted in the Norton Critical edition of the novel) fills in many details about the these political contexts as they appear in Middlemarch. Another excellent source is Nancy Henry’s chapter “George Eliot and Politics,” which you will find in the Cambridge Companion to George Eliot, edited by George Levine. Any scholarly edition of the novel will say something about its politics in the introduction or footnotes as well. A useful summary of the major Victorian Reform Acts and some related links can be found here on the Victorian Web. The UK Parliament website includes a summary history as well. A much more detailed analysis of the 1832 Act is here at the Branch Collective.